I must admit I’ve been putting this off for a couple of weeks. It’s been almost a month since Ray Comfort’s new anti-evolution film, Evolution Vs. God, came out and I’ve been dreading the moment where I had to endure a sit through it. But this morning I sat down on the sofa, took a deep breath and pressed play. First of all, the film is quite well made. The graphics are nice and the editing is effective. Manipulative (we’ll get to that later), but effective. Ray Comfort deserves recognition too, because, agree with him or not, he has an abundant amount of charisma and charm. You don’t even see him on screen until the last minutes of the film, but he has you captivated all the way through. So he’s certainly good at his job. But that’s where the praise must stop, I’m afraid. As a Christian and as an evolutionist, I’m stuck right in the middle of dichotomy assumed by the film between evolution and God. I’m convinced that there’s nothing anti-God about evolution, nor is there anything anti-evolution about God. Certainly, evolution can be interpreted in ways that exclude God, just as well as God and the doctrine of creation specifically can be interpreted in ways that make the acceptance of evolution impossible. But neither of these interpretations are necessary nor are they, in my opinion, correct. The Christian doctrine of creation grants ontological integrity to nature and so demands that science, as the study of nature, be taken very seriously indeed. Theology and science, therefore, must be integrated. They cannot be pitted against each other, as everyone in this film seems to be doing. As someone who takes science very seriously (because I take theology very seriously), I was disturbed by the fundamental disregard the film had for science and scientists. Throughout the entire film, the scientific method is undermined, the results of a century and a half of scientific research dismissed and the integrity, intelligence and motives of evolutionary scientists called in to question. In the second half of the film Comfort claims that not only do those who accept evolution, scientists and lay people alike, do so despite their intuitive knowledge that God created the world, but they do so in order to justify their own sinful lifestyles. “Evolution gets rid of moral accountability,” he claims. Attributing such ulterior motives to strangers and assuming such a position of superiority over them is both uncharitable and offensive. But Ray Comfort has never been afraid of offence, has he? As anyone familiar with his previous work, especially with The Way of the Master, might expect, his ten commandments witnessing spiel inevitably makes its way into the film. I admire Comfort’s zeal and he seems genuinely concerned about people’s souls. But rhetorically cornering people into the Kingdom of God? That makes me very uneasy. It might work every once in a while, but mostly it’ll just confirm the widely held prejudice that Christians are hypocritical assholes who jump through hoops to avoid their so-called master’s command of love. The thing they call love is just condescending rudeness. While we’re on the subject of Comfort’s interview technique, I must say that the longer I watched the film, the more disturbed I was by how manipulative his use of street interviews was. His use of apparently stumped experts is one, somewhat dishonest thing. But using regular folk off the street as mere props, asking them leading questions and selectively editing their responses in order to further your agenda – that’s not nice. It’s not charitable. It takes neither people nor the task of telling the truth seriously. And I really think it fails to live up to the love for one’s neighbour Christians are supposed to have. Right? Because isn’t that the logical implication of the evolution-as-religion critique so often levelled by anti-evolutionists? That evolutionists believe something just as baselessly as religious people and are thus just as stupid? And here I thought faith was a virtue. The problem with this rhetorical apologetic device, beyond the obvious foot-shooting, is that it plays into the hands of those atheists who portray faith as nothing but the cognitive acceptance of propositions without evidence (or, perhaps, despite the evidence). That is not what faith is – according to Christianity, at least. Believing is not the same as accepting something as factually correct. Faith is not the same as trust in experts. Saving faith in Christ is the deep existential orientation of your whole person towards the God witnessed to in the Bible and proclaimed by the church. The acceptance of a number of proposition is part of that, but arguably a relatively small part. Loving God and neighbour is infinitely more important (see 1st Corinthians 13, for example). So, not only does this characterisation of faith quite unhelpfully play into the hands of atheological apologists, but it shortchanges true Christian faith as well. Stop doing that, creationists. Please! 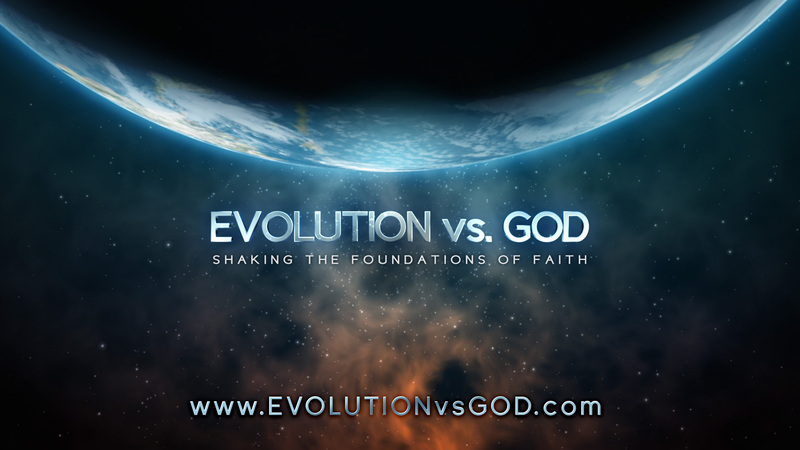 In conclusion, Evolution Vs. God is not a serious documentary film. It doesn’t attempt to weigh the evidence for evolution fairly and objectively. It doesn’t even mention any alleged evidence against evolution! It’s simply a highly problematic piece of creationist propaganda. It equivocates, it manipulates and it fails to live up to a basic standard of truth-telling. The choir will undoubtedly love what it preaches, but fair-minded viewers will be put off by its dishonest tactics. Watch the film for free here. In my view the whole approach does a grave disservice to the Christian religion. Growing up as a Catholic in UK I never met a Christian who didn’t believe in evolution and it is only comparatively recently that I became so aware of them. Most Christians in the world aren’t creationists. To make people think you have to be one to be a Christian or that most Christians are creationists creates a terrible barrier to conversion. I completely agree! I have nothing against people holding a creationist view of the relevant passages in the Bible and of science. Some of the most gracious and wonderful Christians I know hold such views. It’s the vehemence and exclusivity that I object to. And the lack of humility, both in regards to theology and to science. That’s what creates a needless barrier to conversion, as you say. Totally just posted a response to this film right before I was redirected to your take on it. Couldn’t agree more, and I particularly enjoyed your comments on how the interview techniques employed in this video contributed to an almost awkward representation of the legitimacy of evolution. Your words on faith were very insightful. This was definitely an interesting read. Cheers, mate! I appreciate it! I get all my snark out by cheering loudly to Tyler’s articles! 🙂 Thanks for the comment, Laura!